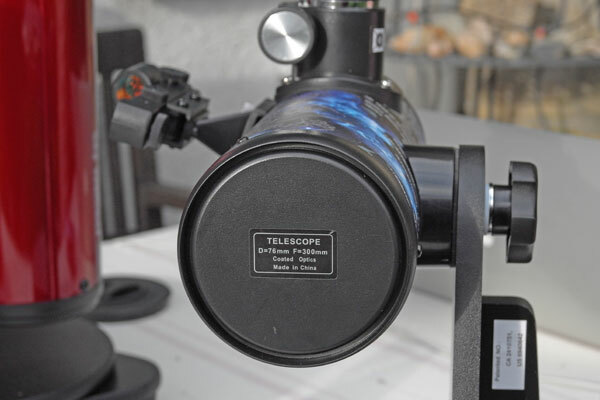 On this page, I present my (first) personal experiences with collimating my various telescopes (Newton telescopes) and also provide some background information on this topic. Note: I sold the Meade LightBridge 10" Dobson telescope in March 2016 and gave away the Sky-Watcher Heritage 76 telescope at the same time. In spring 2017 I also gave away the Sky-Watcher Heritage P130 to a friend. I therefore can no longer report any experiences with these scopes here. 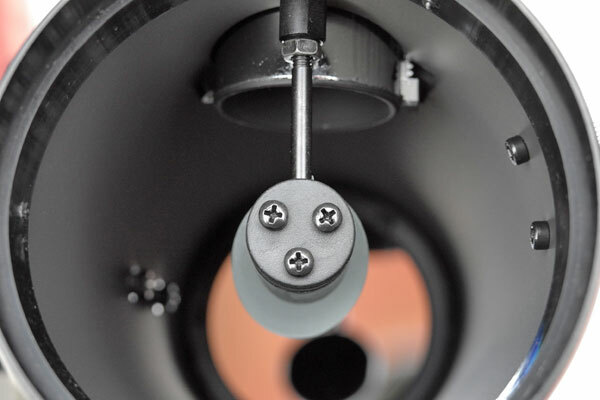 What Is Collimation, Why Do I Need a Collimator? In optic, the parallel orientation of light beams is called collimation; in the broadest sense the word collimation simply means "to align" or "to adjust." 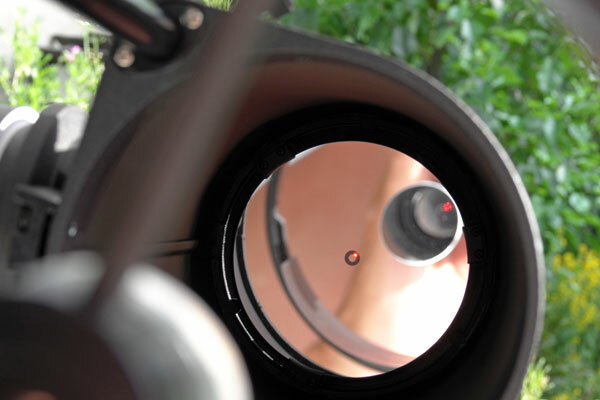 Newtonian reflector telescopes are considered as prone to maladjustment (also called decollimation), for example as a result of rough transport (during the delivery or when brought to an observation place). 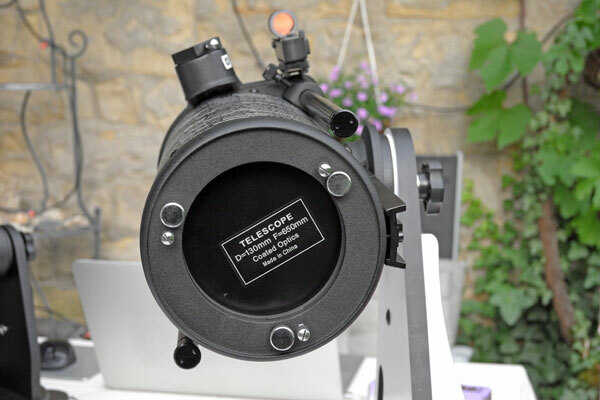 To adjust misaligned telescopes correctly, a collimator is used. 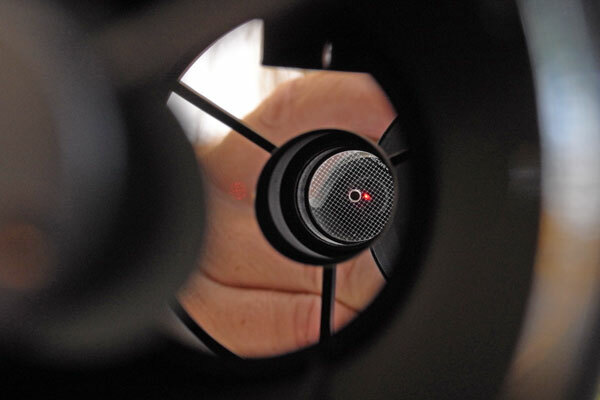 A collimator using a laser beam is also referred to as a laser collimator. 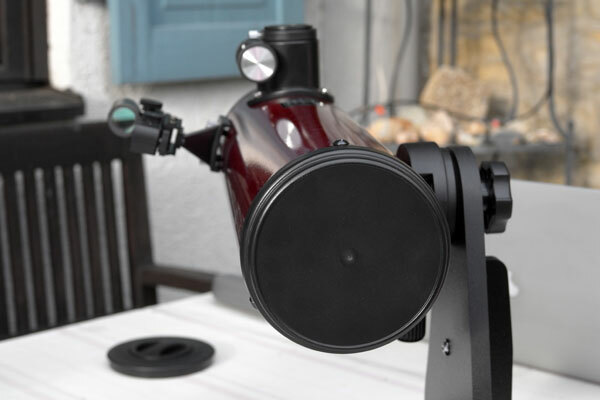 In the case of a Newtonian reflecting telescope, the primary and the secondary mirror must be adjusted so that they are mutually centered as well as centered on their optical axes. Other types of telescopes like refractor telescopes can also be decollimated / maladjusted, but here I cover only Newton telescopes (and even only Dobsonians, but that's irrelevant...). a 45 degrees inclined reflector or frosted glass with or without a "target mark" on which the quality of the calibration can be judged. 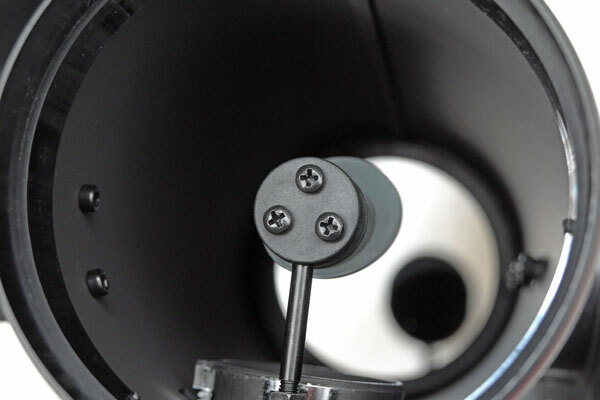 The 45-degree tilt makes it easier to assess the quality of the adjustment, when turning the adjustment screws for the primary mirror at the lower or rear end of the telescope. Some devices also allow you to adjust the intensity of the laser beam (usually lasers are, at least in the dark, too bright). For copyright reasons, I do not present any images of commercial laser collimators here, and instead, would like to refer you to the pages of the respective distributors (see References). 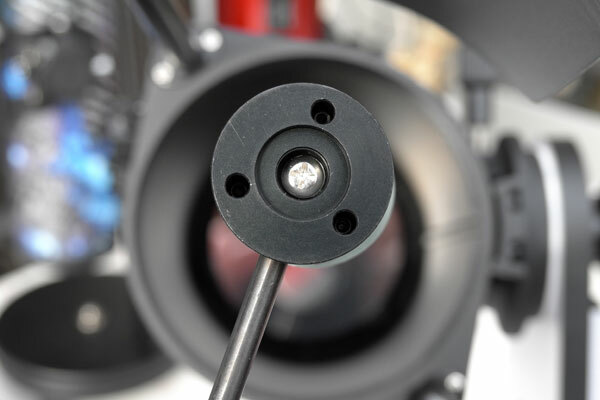 Baader Planetarium offers a laser collimator, called Laser-Colli Mark III (see photos below), which differs from other collimators by having a vertically mounted transparent disc with a central hole and a grid of crosses to show the position of the the laser dot. Thus, one can observe the adjustment process when adjusting the primary mirror. Moreover, the device has a particularly large cut-out, which also reduces its weight. Since this collimator was selected in a comparative test by the magazine Night at Sky in 2010 as the winner, I decided for it. 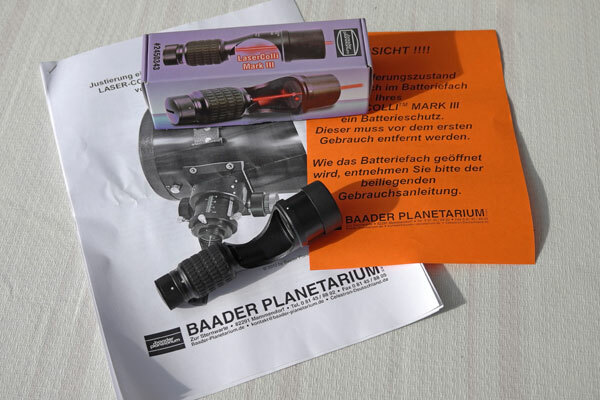 It is a little more expensive (85 EUR) than other devices (but there are also much more expensive devices ...), but Baader is considered to be a renowned manufacturer of astronomical products, and therefore, I hope that the device was adjusted properly at the factory (you can re-adjust it). is eventually reflected by this back into the collimator where it hits a reflector, frosted glass or glass plate ("reference plane" called by Baader Planetaium for the Laser-Colli III), which serves for adjustment. First, the secondary mirror is adjusted (if possible). Then, the main mirror is adjusted (if possible). Below I will outline only the principle of adjustment. For details please refer to the manual of your own adjustment laser. 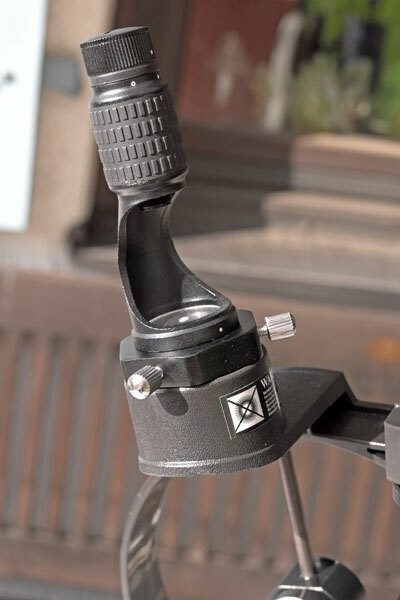 All in all, the adjustments take only a few minutes, provided that all the conditions are met for an adjustment (center marker present, adjustment screws on main levels available, see below). Note: On YouTube there are numerous videos (in English) available that describe the collimation of a Newtonian telescope (see References). 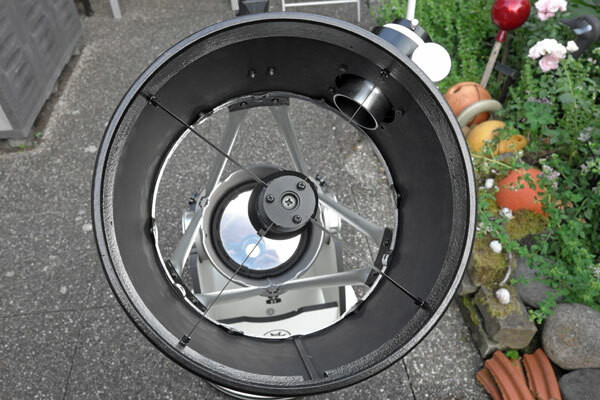 >> Set up the telescope horizontally so that any adjustment screws that might fall down cannot fall onto the precious primary mirror. 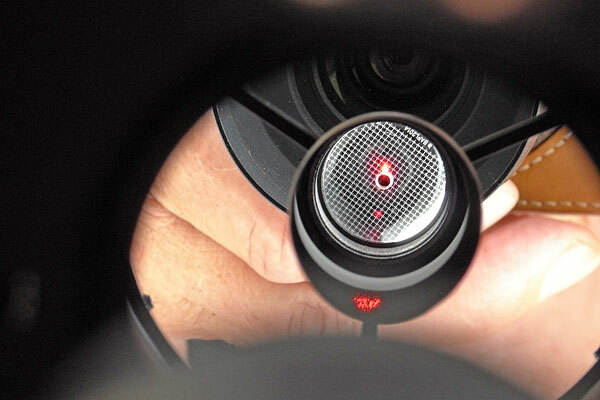 In this step, the laser spot is moved to the center of the main mirror. 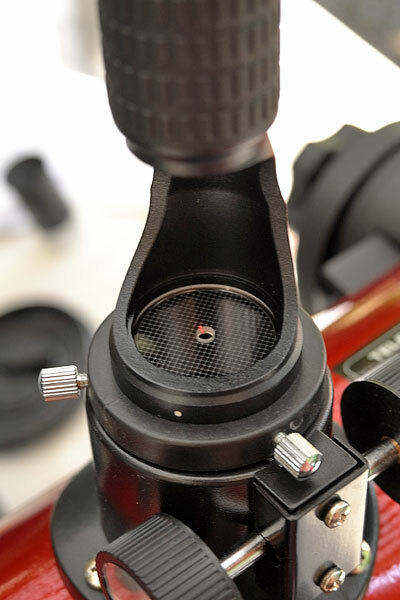 To do this, three adjustment screws (Allen or Phillips screws) that hold the secondary mirror are adjusted - gently in small steps while observing how the light spot moves. When doing this, look into the telescope from the front/top. 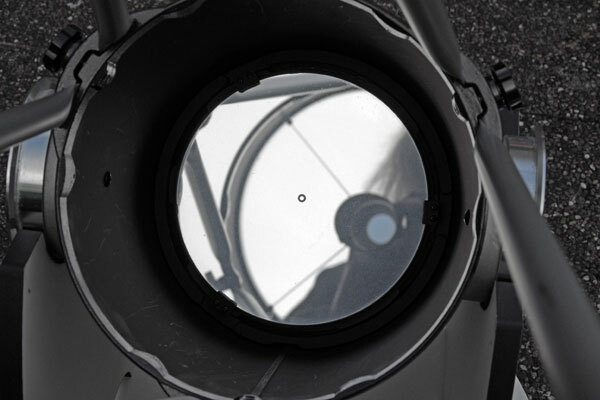 Problem: Better telescopes have an annular mark at the center of the primary mirror (the label does not interfere with the observation), into which the light spot can be moved. With cheaper telescopes this label may be missing. Then it is very difficult to find the center of the mirror. 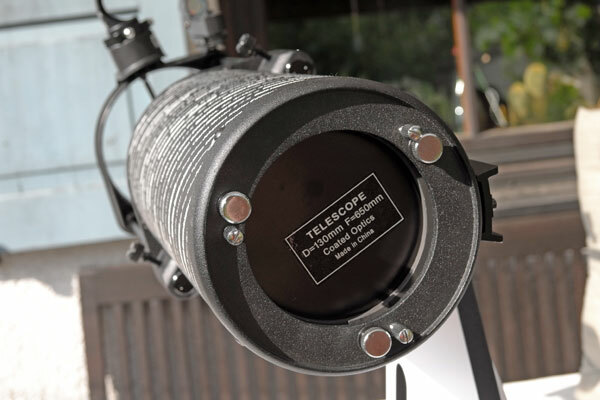 >> Set up the telescope horizontally (if not already done so) and go to the back side of the telescope. 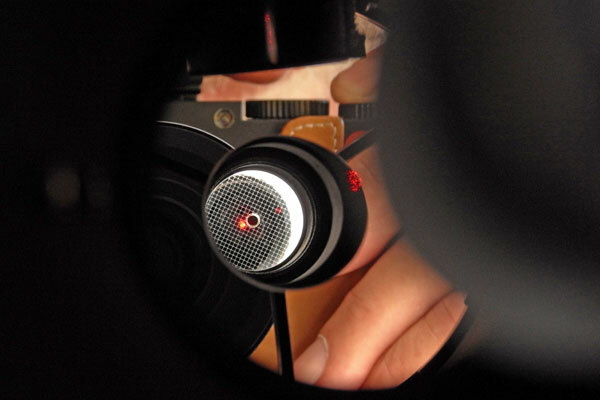 In this step, the laser dot is moved to the center of the reflector/glass plate of the laser collimator (for the Baader Laser-Colli into the hole of the glass pane, so that the light spot can not be seen!). 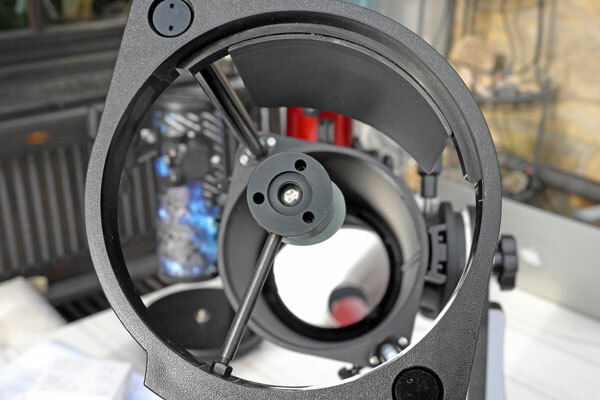 For this purpose you turn three adjustment screws on the telescopes bottom and observe how the light spot moves. 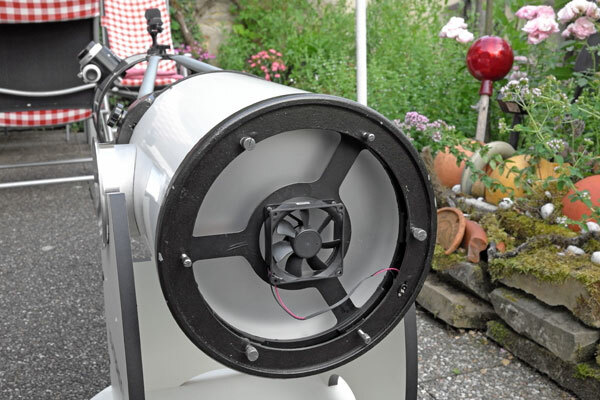 Thanks to the 45 degrees inclined reflector / frosted glass or the cutout in the device, you can do so from the back end of the telescope and track the movement of the light spot (or you ask someone to track the movement of the light spot). 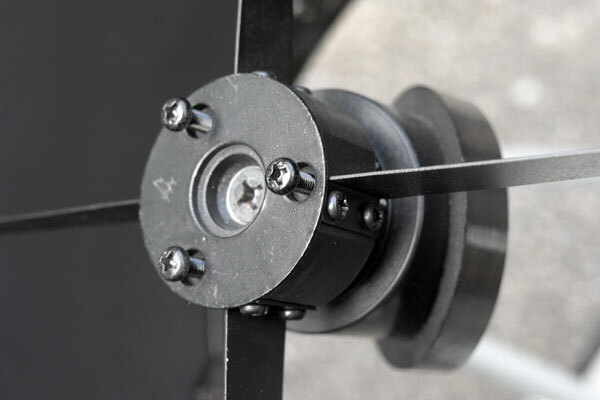 Note: Some telescopes use only three screws with pressure springs for adjusting the primary mirror, others have three additional locking screws. 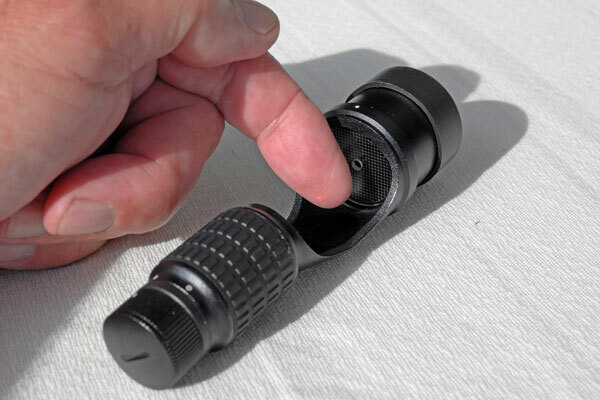 Larger telescopes have pairs of tension and compression screws. 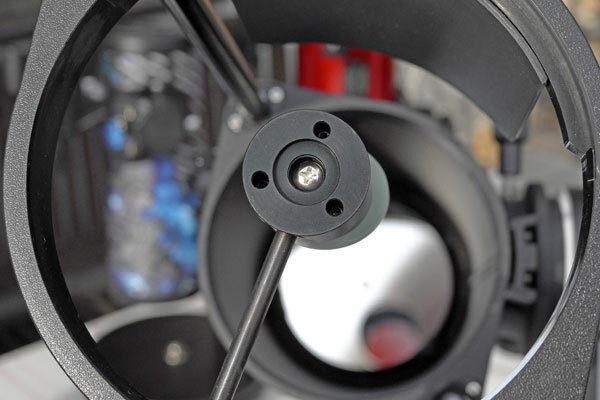 In the case of the locking screws, the alignment process has to be performed"iteratively", because the locking screws can also change the alignment - so this can be somewhat tricky ... This is probably also true for the pairs of screws. Thomas: The secondary has 3 small adjustment screws but the primary can't be moved at all. There's also no center mark on the primary so it's not like you'd know by adjusting the secondary if it is collimated or not. Really there's nothing that can be done on these and they're meant to use as-is. 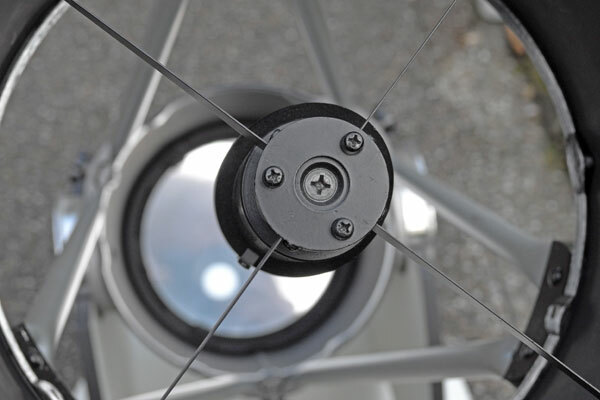 Luminova11: There are 3 collimation screws on the secondary, which when used together can also adjust the inward travel as there is no centre screw. 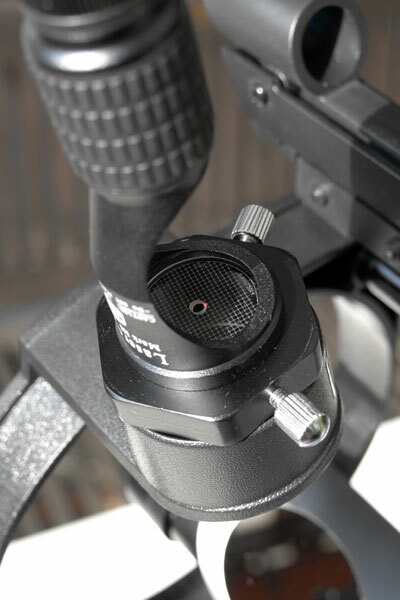 There are no primary collimation adjusters although with care some adjustment is available by slackening the mounting screws and moving the rear cap by hand. No adjustment was needed however as it was perfectly collimated out of the box. Longjohn54: Primary is fixed and looks to be aligned in the tube. The secondary is pointing at about 30mm to the left of the main mirror's unspotted centreline. Once straightened it should be reasonably easy to collimate with the normal three screws (somewhat fiddly though). 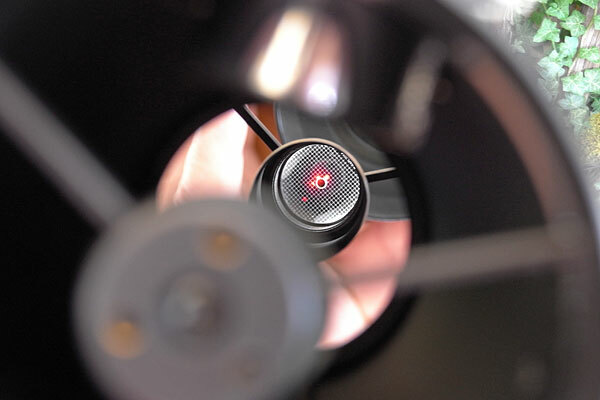 Left: The laser light dot meets the reference plane slightly next to the hole so that it is visible on the photo. I repeated the adjustment, and it seems to be OK on the whole. Unfortunately, the performance of the Heritage 76 does not satisfy me at all. The Venus as a crescent and the Saturn ring were virtually unrecognizable (about 10 July, 2015), because the view showed strong interference effects at the center. This might have also been caused by air turbulence, but in my other telescopes, I could recognize both objects well (which, of course, was to be expected based on the telescope data as well). 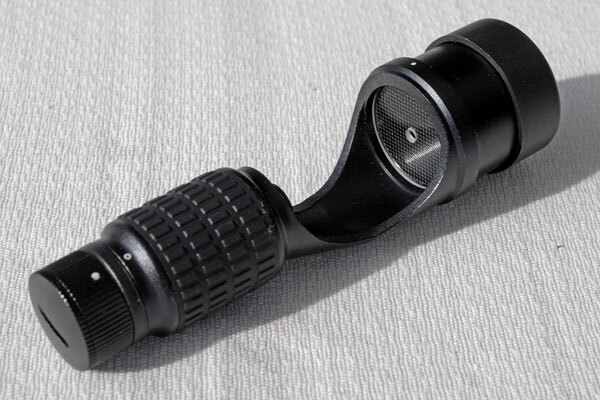 mkettler: From what I read on the interwebs, the 100p has an adjustable secondary, but not an adjustable primary. However, I have no experience with the scope myself. 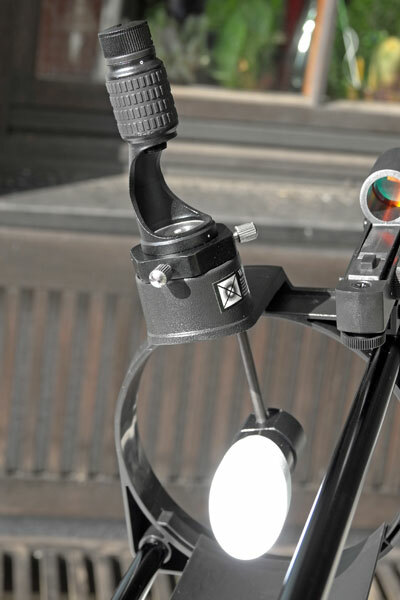 The general idea at that point would be to adjust the secondary to obtain collimation between the two mirrors. Assuming the primary was properly aligned when they made the scope, this should work. Not normal, or ideal, but it should work. terrynak: One problem is that the primary mirror isn't collimatable. So I unscrewed the rear end of the scope, center-spotted the primary mirror, then screwed it back on. 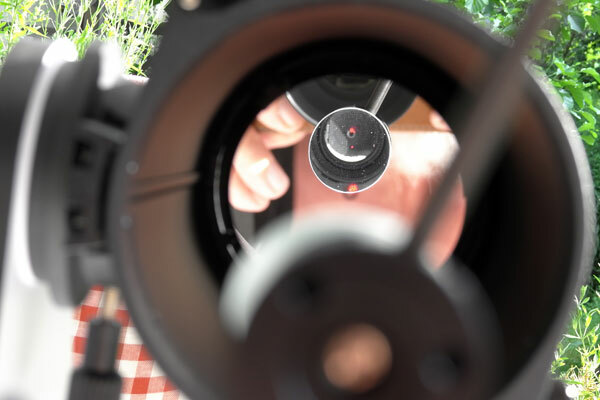 I then collimate the scope by adjusting the tilt of the secondary mirror by fiddling with the three allen-head screws on the secondary holder until the secondary is aligned with the primary (by looking through a collimation cap attached to the focuser). Thanks: I have one and it didn't really need collimating. I used a laser and checked it. At that size mirror you can judge without having it spotted, I tweaked the secondary ever so slightly, the primary was perfect. I repeated the adjustment, and it seems to be OK on the whole. The performance of the Heritage 100P is significantly better than that of the Heritage 76, and after adjusting it, I was able to recognize both the Venus as a crescent and the Saturn with ring (but without Cassini division and details) (about 10 July, 2015). Since both were positioned quite lowly above the horizon, visibility conditions were not really good, and the air was very restless. 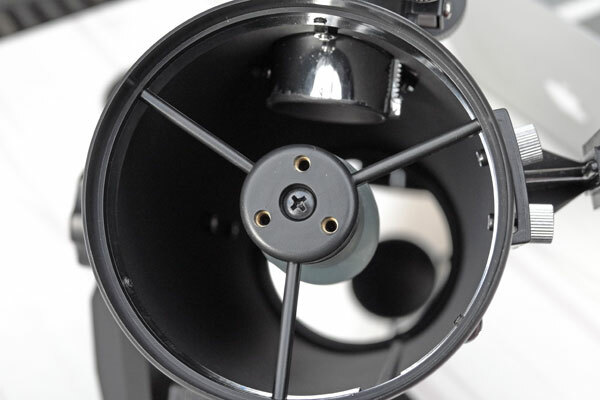 While the Sky-Watcher Dobson Heritage P130 is still a "cheap" telescope, it already fulfils the conditions for an adjustment: The main mirror has a center mark and is adjustable (three larger spring screws and three elongated screws). Therefore, I can show more details of the adjustment process on the photos below. By the way: You can use the same Allen key as for the Heritage 100P (an IKEA-key) for adjusting the secondary mirror. I repeated the adjustment, and it seems to be OK on the whole. The performance of the Heritage P130 is significantly better than that of the Heritage 76 and also better than that of the Heritage 100P. After adjusting the P130, I was able to recognize both the Venus as a crescent and the Saturn with ring (but without Cassini division and details) (about 10 July, 2015), and both were a little bit larger than with the Heritage 100P. Since both were positioned quite lowly above the horizon, visibility conditions were not really good, and the air was very restless. 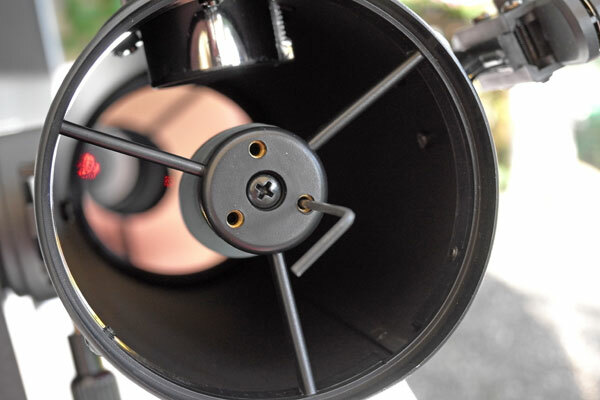 The Meade LightBridge 10" Dobson telescope, of course, meets the conditions for an adjustment: The main mirror has a center mark and is adjustable (three larger spring screws and three fixing screws). After an initial adjustment, Saturn and Venus exhibited a definite coma at larger magnifications. I also found that I had fixed the main mirror incorrectly. So I had to repeat the adjustment. 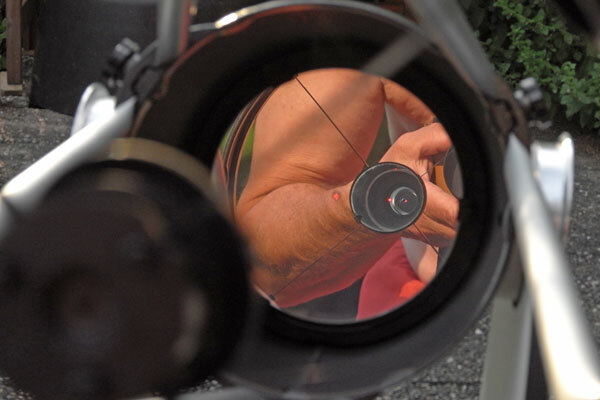 Here, the secondary mirror got loose, so I had to re-orient it again toward the eyepiece opening. I do not know, whether I managed this perfectly. Anyway, everything is much better, although probably not perfect, after my second adjustment. Venus crescent and Saturn with ring were clearly visible afterwards (about 10 July, 2015), albeit without Cassini division and details. Since both were positioned quite lowly above the horizon, visibility conditions were not really good, and the air was very restless.